I have just finished presenting at TRAVELtech 2009 on trends in social media, mobile and my new concept of EveryYou. There is a concept from psychology, economics and demographics called Individuation. I will dodge the Carl Jung and Neitzche inspired definitions and give you the short one – Individuation is the process in which individuals become differentiated from each other. I am seeing the theories of individuation coming into the mobile and social media space in travel and I predict that we will all have to come to term with this notion as we develop means for capturing consumer attention. "a continuing increase in computational power and associated memory storage capacities will lead to circumstances in which each and every single person can be coded as, and treated as, a separate individual and therefore not necessarily as a representative part of any group, sample or population"
This is the concept of Individuation that the travel industry can now embrace to target consumers on an individual level rather than through representative group samples. In the past we have undertaken consumer planning through analysis of the average behaviour of a group of consumers. Individuation in this context says that once we have the right matching of technology and social trends we can move from tracking the average, generic profiles or demographic groups to at scale analysis of what Hanckock et al call “specific instances of momentary behaviour of one single individual”. This already exists in psychology, neuro science and molecular genetics where the combination of data, technology and social preparedness allows those sciences to be able to track and understand for the first time “how specific individuals perform their own personal and very complex acts of cognition” (Hancock et al again) rather than rely on averages. In travel we can use these same techniques to classify and recommend at a level of EveryYou rather than Everyone. The reasons I am attracted to this concept have arisen through the technology capabilities that we now have and the community/social environment we are now in. Let me explain how this happened and why you should care. In the early days of online travel we revelled in the data we were able to collect from customers but really we were only able to see that data in two dimensions – Breadth and Depth. By breadth I mean that we were able to use and collect data on more than one person interacting with the site and sometimes other sites. By depth I mean that we were able to track the different things that consumers did on the site. This allowed us to manage our sort orders. To bias the display based on consumer behaviour to help generate what we think are the best result for a basket of consumers. In the last few years we have improved on this and added a third dimension to our data collection and analysis. We have added Context. The ability to see the inter relationship between the data we have on one person and the data we have on others. Through our actions, those of the consumer and other consumers we can link previously unrelated data based on the relationship between different people and past collective behaviour rather than one off activity. We have seen this in the complex CRM systems we have all bought and use every day. The common theme with the first three dimensions is that we have collected the data from consumers “without their knowledge”. That is not as sinister as it sounds because we have regularly asked for consent. The fourth dimension is Community – which is data that is freely given to us by the consumer. Often unrelated to a particular purchase. And not necessarily for a tangible gain. Though there is very often an intangible gain. What are examples – writing reviews, forwarding links to friends, making recommendations to strangers, building online profiles, contributing to forums, writing a blog etc. 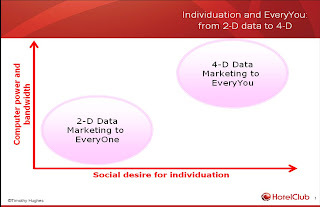 The combination of these four dimensions of data can result in an individuated experience. An experience in online media, retail, or community that is unique to an individual but also part of a group experience. We have seen this individuation in media already. Your twitter feed, facebook newstream and RSS reader list is different to any other anywhere. As the Digital Deliverance group said in their post "What are Individuated Media (What are the New Media)?" Collecting four dimensions of data is not easy. It requires technology leaps in bandwidth and computer processing power - which we now have. The technology needed to allow us to capture and process the data is now matched with the desire of internet users to seek answers to open ended questions and contribute into a community process. For us as marketers, retailers and media people it means we no longer have to be constrained to gear our marketing to EveryOne. Sure we developed demographic cuts and installed CRM systems to improved the targeting but we were still marketing to EveryOne in the hope of catching the individual. Now with the matching up of technology and social desire we can seek to market to the EveryYou. The four dimensions of data and technology now allows us to do away with 30 years of econometric dependence on distribution, central tendency and variation – you know bell curves – and instead we can envisage the ability to research an individual at scale rather than rely on measuring their responses as part of a group or sample. Instead of seeing individual behaviour as a “variance” or “outlier”, we can aim to target Every combination of individuals. The EveryYou rather than EveryOne. The EveryYou concept I am working on says that technology and social change put us in a place where we can work on a recommendation of one rather than relying solely on generalisations. In the travel industry, EveryYou means we can answer the question “where should I go next” with a specific answer. We can answer the question which hotel should I stay in "Rome" with an answer that references past purchase behaviour, past reviews written, friends on facebook, people trusted, media read etc. That takes into account that human beings are a mess of contradictions in the things that they like and want. For instance I love the blues, Byzantine mosaics, bad zombie movies and body surfing. No bell curve can market to that. Companies can treat users as co-researchers in developing a bespoke solution for their individual requirements. The user's needs are met by conjoining the company's expertise in travel and the user's expertise of themselves, thereby creating a tailored travel solution for one. Consumers are and will be willing to provide information on the understanding that it will eventually be deployed to their benefit. If we use the technological capabilities and social trends available to their fullest potential then we can conceive of a day where we do away with general principles and customisation for the group and instead market to the apparent contradictions in consumer behaviour and aim for the delivery of specific, unique and targeted answers. We could kill off the head, body and long tail of sales and replace it with a sale of one, a market of one for the EveryYou. Want to hear more? Stay turned to the BOOT as this will be the major area of analysis and work for me on the blog. You can also see me speak on this at WebInTravel October 20-23 in Singapore. BTW - sorry to get all proprietary but this concept of EveryYou has been put together by me and all in the IP including copyright in it is mine. PS - anyone know how to turn it the right way round? Excellent information - thank you. Most people don't know how important things that you highlighted are. Thanks for helping spread the good word! A good non-travel example of this EveryYou concept (love the name, btw) is the Netflix.com recommendation engine for DVD rentals in the U.S. This system ties in several inputs mentioned in your presentation, including peer-based recommendations, previous ratings, and shopping history. Of equal interest, too, is how the growing sophistication of APIs (Facebook, Twitter, Google Maps) will allow smaller travel players with technical expertise embrace the EveryYou concept. Trazzler.com is one site that comes to mind that is quickly heading in this direction. Agreed, EveryYou is on target. In addition to the 4D's you discuss there another vector that can create the "mytravel" 1-1 custom experience. With opt in, user profiles can be used in combination with complex or smart search to deliver the custom experience on a mass scale. Deals can now be filtered and sliced and diced to match user needs in real time. This is not one fits all Google tech. Its nextgen search. Check out www.exalead.com. Brilliant post! The idea that the individual can be marketed to on a one-2-one basis thanks to new technologies is something I've been thinking about a great deal. It sets huge challenges for brands and the classic approaches to marketing. @Pete M - thanks. Neflix is a great example of a start. What I am hoping with this concept is that Netflix, Last.fm and travel companies can start to develop recommendations from data outside of the site as well. Bringing in more of the 4th Dimension by drawing on reviews, interests, commentary I (and other individuals) makre outside of the specific site. As you say APIs are a critical part of that. @Michael G - will take a look. Thanks.